Keep on top of the trends with new Halloween party themes that will surprise your guests! Here are a few new themes that will appeal to guests of all ages. You can't go wrong with these themes mixed with the best Halloween party supplies around. We even added a few handpicked and frighteningly fun decorations we recommend to go with them. Invite your friends to a terrifying Halloween party perfect for the undead! 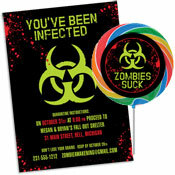 They'll be "infected" with fun once they receive your invitation, so make sure to turn your party space into a quarantine zone with the perfect party decorations. Warn your guests before they enter with gory door decorations. Wrap your front door in caution tape and add a "Keep Out" sign. Give your entrance an eerie glow with green outdoor lighting. Make your home look like there’s been a zombie attack with blood spattered walls and floors. Spatter red poster paint on wax paper and hang the sheets on windows and walls. Don't forget an elaborate corpse buffet! Lay out a t-shirt, flannel, pants and shoes on your buffet and fill it with trays of ribs, chicken wings, hotdogs and hamburgers, and pulled pork. Add a zombie mask and skeleton hands holding tongs coming out of the sleeves for a Corpse Buffet. Send guests home with a Zombie Survival Kit. Bandaids, energy bars, zombie vaccine (tic tacs) make a fun themed favor. 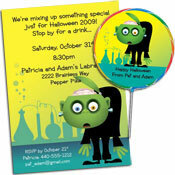 Throw a Halloween party that’s “alive” with guests and fun, choose a mad scientist theme. You’re guaranteed to have a Halloween bash that’s crawling with mad scientists and lab engineered monsters, not to mention kids and adults who are having a great time! Create a perfect creepy lab for your party space! Line a table with beakers, graduated cylinders, and test tubes. Fill with colored water and dry ice to make everything bubble. Don't forget to dress up your guests, too! Hang white lab coats on a rack near theentrance, and guests can transform themselves into mad scientists as they walk in. Keep your centerpieces simple! Place a Electrostatic Ball in the center of each table. It fits the mad scientist theme and will keep guests entertained. Favor bags filled with chocolate eyeballs and brain gummies are perfect for young mad scientists! 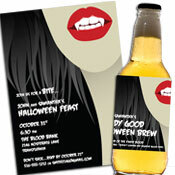 Let Party411 help you re-"vamp" your party and bring your annual Halloween celebration back from the dead. We have invite, decoration, and favor ideas to die for! MWAHAHAHAHAHAHAHAHAHAHAHAHAHA! Make sure to hang warning signs outside your party space that say "HIGH RISK AREA" and to "ENTER IF YOU DARE” and “VAMPIRES HAUNT HERE”. Choose an over-the-top favor like a Vampire Slayer's Kit! Fill a box or favor bag with a mirror, garlic, cross, and a vial of "holy water" so guests can protect themselves at your undead bash and when they head home. 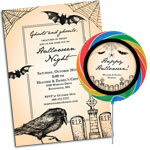 Give your Halloween party a classy touch with a vintage theme! There's plenty of steampunk style Halloween decorations that will turn your party into a sophisticated soiree. Decorate with antique style candelabras and add a fog machine for an eerie feel. Scatter skulls around your party space and add top hats, monocles and bow ties for a whimsical touch. Jars filled with sticky eyeballs, fake brains and bones are a nice touch. Add vintage style labels to tie in the theme. Animal skeletons and even taxidermy make a perfect decoration for a vintage Halloween party! Make sure to have a few signature Halloween cocktails for your sophisticated guests. 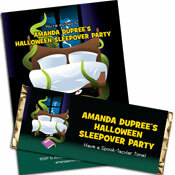 Host a spooky sleepover party your kids will never forget! Choose party decorations that are perfect for an overnight event. Hand out plenty of glow accessories! Bracelets, necklaces, and even glasses are a fun wearable once the lights go out. Get the kids involved by having them make their own Halloween desserts. Start with cupcake decorating and make-your-own dirt cups (chocolate pudding, oreos, and gummy worms). Make sure to have plenty of kid-friendly activities: pumpkin decorating, Halloween karaoke, horror film screenings, and a costume contest are all great options. Before heading to bed, have a bonfire - it's a perfect time for ghost stories and s'mores! Have fun planning your next Halloween party with new themes from Party411!